On 14 December, Aman Le Mélézin will open for the Alpine ski season, which promises to be a snow- and fun-filled few months. Ideal for families, the resort now features a Children’s Club, offering youngsters aged three to 15 years a communal space to socialise after ski school. Three separate chalets located adjacent to Aman Le Mélézin offer arts and crafts, a variety of social games, and interactive cooking lessons. Alongside hot chocolate and a special children’s afternoon tea, a range of healthy snacks and fruits are also served. The Children’s Club is supervised and open until 10pm every evening, giving parents the chance to take time out in the spa or enjoy an intimate dinner, comfortable in the knowledge that their children are being looked after by professionals in a safe environment. Aman Le Mélézin will once again be hosting celebrated wellness and fitness expert, Rudi Keil, this winter season. With over two decades of experience uncovering the connection between mind, body and spirit, Rudi has become an expert on achieving optimal health and wellbeing at any age or fitness level. His holistic approach to wellness incorporates a disciplined exercise, nutrition and supplement regimen that has transformed the bodies, and lives, of countless people through a signature combination of multi-functional workouts and smart nutrition. Rudi will offer both one-on-one and group sessions at Aman Le Mélézin’s recently refurbished 767-square-metre holistic spa this December 15-22 and from 24 March to 7 April. An extensive wellness sanctuary for guests to relax in after an exhilarating day on the slopes, the recently renovated spa comprises two floors of the hotel and offers five spacious treatment rooms (including two double and one signature Thai massage suite), a yoga studio equipped with TRX equipment, and a hydrotherapy area with experiential showers, a cold plunge pool, Turkish hammam and wooden sauna. Flanked by Jacuzzis, a tranquil 14-metre lap pool lies beneath vaulted ceilings. Guests can also take time out in the spa’s relaxation lounge. Jackson Hole has already welcomed its first snowfall this year, so while the valley’s forests are still cloaked in fall’s magnificent colours, winter is definitely on its way. By mid-December, the views from The Grill at Amangani will reveal snow-capped peaks all around as guests dine on exceptional farm-to-table cuisine. This elegant, redwood-panelled restaurant is known for its seasonal menus featuring sustainable ranch meats, fresh fish and locally-grown organic vegetables. Fresh for 2019, The Grill at Amangani will host a temporary installation of Arva, Aman’s recently introduced seasonal Italian dining concept. From 14-21 January, Arva, which is based on inventive cooking techniques and utilises just a few simple seasonal ingredients, will serve alpine inspired dishes such as pumpkin gnocchi, with speck and taleggio, and polenta with roasted radicchio and braised pork. At the helm and working together with Executive Chef of Amangani, Bradley, will be Chef Andrea Torre, who currently oversees the kitchens at Amanyangyun, Aman’s latest opening in China. Also new for the upcoming ski season will be complimentary mediation sessions, available weekly for guests who want to compliment a day of intense physical activity with a more mindful experience. Jackson Hole offers some of the finest skiing and snowboarding slopes in the world. Those looking for an adrenalin rush can heli-ski or snowcat powder ski on the more inaccessible slopes, while others may prefer to explore off the beaten track with guided cross-country skiing. Spotting some of the more elusive winter wildlife is best done on snowshoes through the valleys surrounding Amangani, while dog sledding, sleigh rides and snowmobiling are exhilarating activities in the bright winter sunshine. Amangani also provides a fully-equipped gym and a number of exercise classes in the spa and fitness centre. The Amangani Ski Lounge is situated in the heart of the alpine Teton Village in Jackson Hole, just steps from the Bridger Gondola and Aerial Tram which allow quick access to some of North America’s most exciting skiing and snowboarding terrain. The Jackson Hole Mountain Resort alone offers more than 2,500 acres along with a vertical drop of over 4,000 feet. The Lounge provides convenient ski-in ski-out facilities for the slopes of Jackson Hole’s Rendezvous and Après Vous Mountains, as well as refreshments. A ski concierge offers expert advice on ski runs and off-piste terrain, and ski gear and boots can be stored with the Ski Lounge attendant. A 20-minute scenic drive takes guests back to the resort. Those seeking an adventure off the ski slopes can explore the winter wildlife of Jackson Hole and the Rocky Mountain West. 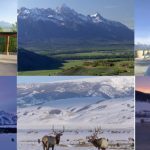 A half-day winter wildlife tour through the pristine valley of Jackson Hole with an experienced guide is the ideal way to learn about the fantastic array of wildlife in the Greater Yellowstone Ecosystem; including moose, elk, white tail deer, mule deer and coyote. Your guide will also interpret animal tracks and explain animal behaviour. Alternatively, for the more adventurous, a half-day snowshoeing adventure explores a wide range of pristine backcountry areas, allowing plenty of opportunity for wildlife viewing.